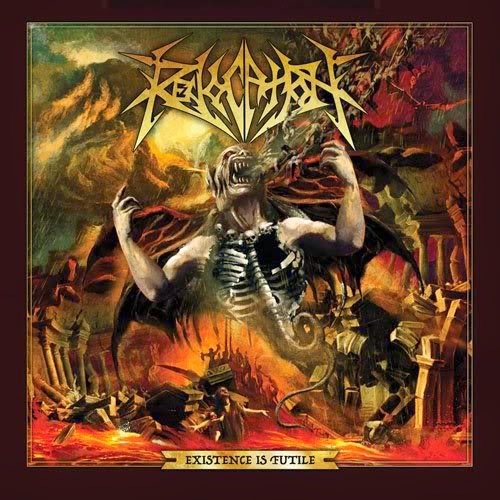 The second studio album from Boston's Revocation, Existence Is Futile is a mixed bag, the quality featuring as much variety as the broad stylistic range the band is known for. Pushing deep into a mix of technical melodic death metal infused with plenty of jazz and thrash influences, Existence Is Futile is nevertheless often repetitive and underwhelming. On some tracks there is so much wizardry going on that the whole is much less than the sum of the parts, like a circus show with a juggler, clown or elephant in every corner but no one holding down the middle. Title track Existence Is Futile and The Brain Scramblers suffer the most from the loss of focus. When Revocation do galvanize and deliver, it is often David Davidson's guitar work that leads from the front with melody-rich themes. The best selections are the two instrumental tracks, opener Enter The Hall an epic 2:27 intro full of muscular promise and stunning if straightforward guitar sweeps from Davidson. The back half of the track breaks into a galloping rhythm, crashing into the hall on the wings of thrash strumming at illegal speeds. Across Forests And Fjords is longer and more expansive, breathing deeply from terrain that sustains metal, Davidson playing the role of point man and chief scout, his guitar work darting all over the landscape. The soaring solo break at the three minute mark salutes the best of Arch Enemy. Anthem Of The Betrayed is the best track with vocals, the chugging strumming coming back to anchor one of the longer and more complex compositions on the album. Existence Is Futile contains tasteful hints of what the band is capable of, but also plenty of examples of good talent squandered in over-ambitious directions. Produced by Pete Rutcho and Revocation. Recorded, Mixed and Mastered by Pete Rutcho.